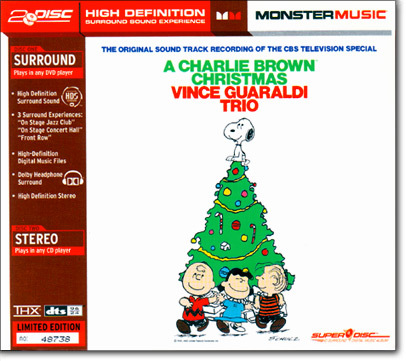 A Charlie Brown ChristmasVince Guaraldi Trio is a special holiday music classic. It is impossible to think of the personable Charlie Brown characters and Charlie Brown Christmas cartoon without the legendary Vince Guaraldi jazz trio and voices from the childrens choir. The original masters were recorded on 3-track, a short-lived music format, and after locating the rare 3-track tape head, these recordings were converted to PCM digital audio at 96k/24bit. New sound mixes, created to simulate a concert hall, orchestra, jazz club and theater listening environment. The 12 Vince Guaraldi Trio performances are presented in multiple formatswith over 150 total song presentations on the DVD alone! Skoubo Graphics worked with AM-DVD to produce DVD graphics to make the users experience even more enjoyable. Animated sequences provide an easy-to-use interface, letting listeners view the song title, artist and progress of each song. The Monster Music SuperDisc offers multiple sound formats, including high definition surround and stereo, on CD and DVD. High definition digital music files, WMA (Windows) and AAC (Apple, iPod), can be downloaded to play on computer or portable music player. Skoubo Graphics created graphic animations for the user interface on the DVD.